McALLEN — The federal trial of a former state judge accused of taking bribes in exchange for judicial favors in his courtroom will remain in Houston, court records show. 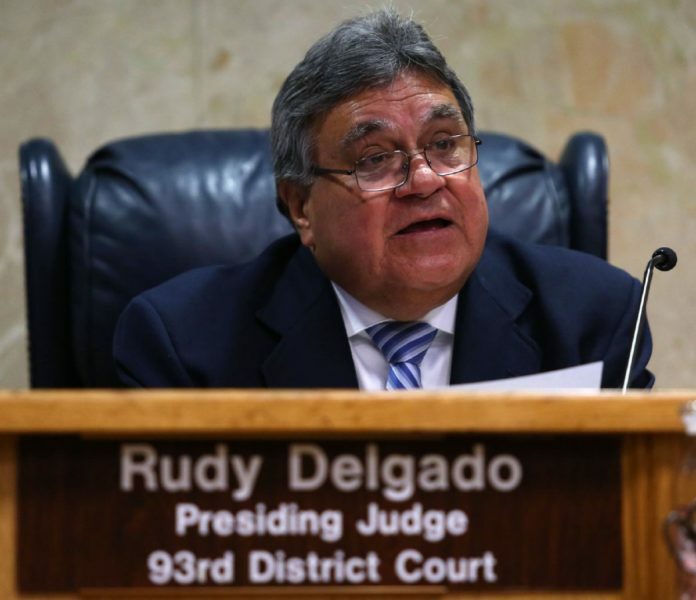 U.S. District Judge Alfred H. Bennett ruled that the trial for Rodolfo “Rudy” Delgado will be held in a Houston courtroom when the trial gets underway in February. The decision comes months after Delgado’s attorney, Michael W. McCrum, filed a motion to have the court reconsider where the trial would be held. McCrum, a defense attorney based in San Antonio, argued in an August filing that Delgado, who is accused of accepting cash bribes from an Edinburg attorney in exchange for favorable judicial considerations inside Delgado’s courtroom, should have his trial held in McAllen, where it is alleged Delgado committed the offenses. Delgado faces eight federal charges related to allegations that he accepted bribes from attorneys and others in exchange for judicial favors in his courtroom. In court records, the government alleges Delgado accepted cash bribes from “Attorney A” — later identified as Edinburg attorney Noe Perez, long rumored to be the informant in the government’s investigation who flipped on Delgado. In the early August filing, Delgado’s attorney cited public policy concerns, the location and availability of his client’s witnesses for trial, and what McCrum says would be a lack of a support system for Delgado if the trial were to be held in Houston. In the Sept. 5 response, McCrum characterizes the government’s assertions in their response as “fallacies,” and addresses each one. “The government’s response is not only notable for what it asserts, but what it fails to address. Its assertions do not fully convey pertinent facts, and its failure to address important factors is telling,” the filing states. The government argued that Delgado’s high profile would make selecting a jury almost impossible in the McAllen division. But McCrum argued previous trials in which there was a high-profile defendant didn’t stop the government from trying it in McAllen. “The government fails to address, however, how such an impediment did not affect the propriety of the government’s decision in filing other cases involving public figures in the situs of their public status,” the record states. He also challenged the government’s argument that because Delgado has made frequent trips outside Hidalgo County, to visit his sons and his attorney, his travel to Houston for the trial would not be a burden. Despite his reasons, the court ruled in the government’s favor, and the trial will proceed in Bennett’s court once the trial is set to begin.